Chandigarh 30th June:- To help banks enhance support and service for their small and medium business enterprise (SME) customers, Infosys (NYSE: INFY) today announced the launch of the Finacle SME Enable . The first-of-its-kind, mobile-based financial and business management solution is exclusively designed to help SMEs not only experience banking services on the move, but also manage their business operations efficiently. Michael Reh, Senior Vice President and Global Head, Finacle, Infosys commented that SMEs today constitute a significant share of gross domestic product (GDP). Convenient banking services as well as agile and cost-efficient operations are key growth drivers for this segment. Banks have a great opportunity to gain a loyal customer base in this segment by providing relevant digital banking solutions, along with an integrated support for their business needs. Finacle SME Enable fits right into this niche and can be a game changer for banks. Chandigarh 30th June:- Imbibing the spirit of adventure, adrenaline and fascination all into one epic drive, Mercedes-Benz India is embarking on a one-of-its-kind world tour with one of the most versatile SUVs in its portfolio - the GLA. 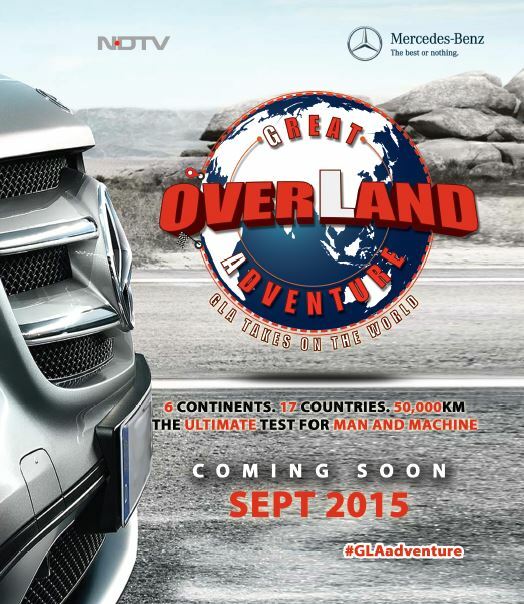 Christened as the 'Great overLand Adventure (GLA), the 'India Made' GLA would be put to a realistic endurance test as it would undertake this epic road trip traversing across varied geographies and climates across the globe. The GLA which will be rolled-out of Mercedes-Benz India's Pune production plant will be traversing across six continents, seventeen countries and clocking more than 50,000 kms, before returning to Pune after six months. For the 'Great overLand Adventure', Mercedes-Benz India will be partnering with the NDTV network. This unique journey which will be flagged-off in the middle of July from Mercedes-Benz India production plant in Pune, will traverse across varying geographies and travel through Europe, Northern and South Africa, North and South America, Australia and Asia. The Great overLand Adventure will touch upon some of the most iconic rallying routes across the world and pay tribute to trailblazers who pioneered this spirit of adventure. The tour promises to present a medley of diverse people and their culture from across the world, new places that many have not explored earlier, and also celebrate various events and festivities across the 17 countries enroute. There will be interaction with celebrities, motorsport legends and adventurers enthusiasts. Eberhard Kern, Managing Director & CEO, Mercedes-Benz India commented that Mercedes-Benz vehicles are synonymous with safety, luxury, comfort and reliability. All these attributes that make the GLA on top of customer preference today, will be put to a stringent test during this World Tour. We are confident that the 'Made in India' GLA will prove its reliability during this arduous global drive and reaffirm strongly the reason for its growing popularity amongst the Indian customers. We are glad to be scripting a memorable precedence regarding the reliability and success of the GLA with this unique Great overLand Adventure. I wish the team all the best for the drive and a time of their life. Siddharth Vinayak Patankar, Editor-Auto & Head of Automobile Programming, NDTV Group and Director, World Car Awards added that it is exciting to be able to take on such an ambitious expedition for the first time from India. The spirit of adventure is universal and we hope to not just traverse many thousands of kilometers but also gain many experiences, learn a lot, and be able to collate several stories along the way. That we can tell these stories to our viewers and readers on-air and online is also thrilling. Chandigarh 30th June:- Prof. Yogesh Chawla, Director PGI honored Prof. Sunit Singhi, Professor & Head, Department of Pediatrics and six officers/officials on their superannuation today by presenting mementoes to them. Sushil Thakur, Financial Adviser handed over beneficiary cheques comprising GPF, gratuity and group insurance. Respective Heads of Departments wished them well in life by presenting bouquets to them. Chandigarh 30th June:- Oakridge International School organized an Educational Trip to Mumbai to integrate the skills & learning in every aspect of school life. The simple exploration was fun, entertainment as well as educational for them. 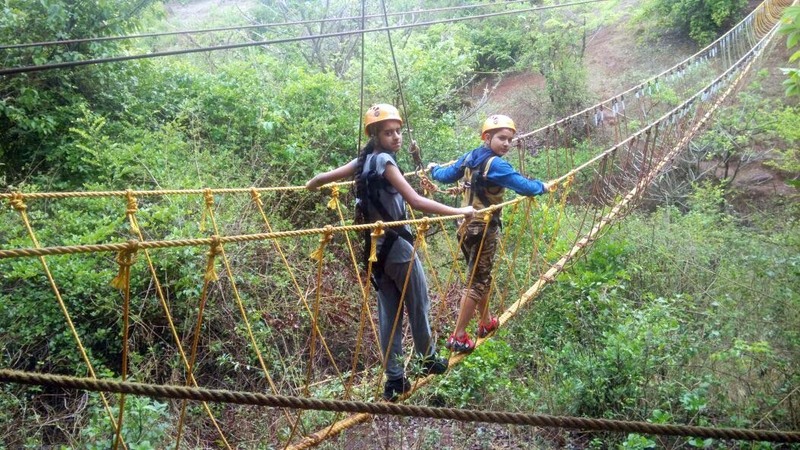 Adventure activities & skill development program organised at the X-thrill camp at Lavassa near Mumbai where students enjoyed adventure and camping. 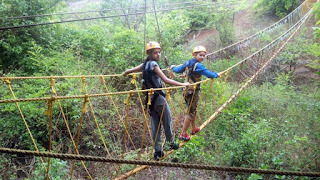 Mountain climbing, rappelling, river crossing and many more activities on the one hand gave the children lifetime experience on the other hand students also got a chance to learnt surviving skill in natural disaster. These exercises and skills learnt by students are useful at the time of natural disasters. It demands entire body and sometimes even more so on mind also. Later, Students got a chance to visit Adlabs Imagican where they enjoyed rides, theme parks, the roller coasters and the scary screams of joy echoed not only through the park but also through the memories of the children. While speaking at the moment Principal, Ramanjit Ghuman said at the moment that such trip provide students opportunities to sharpen important life skills related to communication, teamwork, problem solving , leadership and risk management. Chandigarh 30th June:- Police Station sector 17 has registered a case against Om Parkash Gupta of Booth No. 15, Sec 8, Panchkula (HR) under FIR No. 224, U/S 420, 467, 468, 471 IPC . The case has been registered on the complaint of Rajesh Bansal, Assistant Food and Supply Officer, Panchkula (HR). Om Parkash has submitted fake surrender certificate at Food & Supply Office, Sector 17, Chandigarh claimed it to be issued from O/o Food & Supply, Panchkula (HR) and got prepared another ration card from Food & Supply Office, Sector 17, Chandigarh. Police starts further investigation. Chandigarh 30th June:- Flatchat, a mobile only app for students and bachelors to find accommodation and flatmates has risen 2.5M$ from CommonFloor.com. Founded six months back by Gaurav Munjal and Hemesh Singh,Flatchat enables easy and quick chatting connectivity between a seeker, a prospective owner, a tenant to potential flatmates and other seekers. With the raised capital Flatchat is aiming to make its product team stronger by hiring the best product and engineering talent. The fund will also be used to scale up operations and establishing foothold across the country especially in the cities which have a higher population of students and bachelors. Commenting on the big leap by the company, Gaurav Munjal, CEO, Flatchat said that the rentals problem especially for bachelors and students is a tricky one and we always believed that the best way to solve the problem is not with having more listings or a better UI but a behaviour change in the way owners and seekers communicate, real-time. And that's how Flatchat came into existence and within six months has seen a remarkable growth, thanks to CommonFloor for believing in us since the inception and for this impetus which will help us take Flatchat to the next level. Sumit Jain, Co-Founder & CEO, CommonFloor.com, commented that we are excited to support Flatchat team in their endeavour to simplify the students & bachelors' accommodation concerns in the country. This segment has a good growth potential and Flatchat's unique and technology centric operating model is a differentiating factor which seamlessly connects seekers and owners on a real time basis on a chat based platform. Chandigarh 29th June:- For all those who are waiting to be freshmen soon, WOODS from the house of Aero club brings to you the latest Freshmen Collection 2015. Now say good bye to the routine uniforms and School shoes and try a fresh look this college season. Make a striking impression this fresher's day with Woods exclusive freshmen collection.The beigh and the ink blue ankle length shoes for boys not only compliements the casual COOL look but also are comfortable and have a trendy appeal. Who said sling bags are only for women. Carry your attitude with this compact sling bag and a pair of brown shoes to complete your casual look. Get an exotic bohemian look with the much in demand animal print stilettos and nature-inspired wedges complementing your fusion attire And complement your college look with this stylish beige printed hand bags giving yourself a fashionable and sophisticated look this season. Simple, unique and elegant, that's the mantra for every fresh start.The price of the collection starts from Rs. 2995 onwards and is available at exclusive WOODS stores as well as Woodland stores present in your city. Chandigarh 29th June:- The journey that began with auditions in December 2014 finally came to a glorious end with contestant Prince Narula, an audience favourite, proving his mettle to win the coveted title of the ultimate 'Roadie' in the twelfth year of the show, MTV Hero Roadies X2 powered by Vivo Smart Phone. Prince contested in the finale episode against fellow gang member Gurmeet, both of them originally being a part of the original Roadie, Rannvijay's gang. The show, which saw some phenomenal changes including new Gang Leaders and gangs, saw Prince battling his way to victory till the very last moment of what could be called the most exciting season of the show till date. The finale episode of the massively popular show was every bit the nail-biter it promised to be with both the finalists watching every move taken by the other in order to get their hands on the prize. As expected, the finale was filled with some interesting twists and turns. However, the one person who was the most nervous during the finale, besides the finalists, was Rannvijay as both them belonged to his team. At the beginning of the season both Gurmeet and Prince were a part of Rannvijay's gang. However, Vijender won a Gang Challenge and got the opportunity to swap one Roadie from his gang for another Roadie and he chose Gurmeet from Rannvjay's gang. Vijender's tactic paid off, as Gurmeet made his way to the finals to come face to face with his former gang-mate. Being the finale, the camaraderie and friendship between these two was replaced with the hunger to win! Prince turned out to be swifter of the two and was able to navigate the tricky finale task with considerable ease in order to capture the winning title. On winning the title of the ultimate 'Roadie', Prince Narula couldn't stop gushing about how excited he was. He said that it is a once in a lifetime experience. He lived a part of his life which is unforgettable. Not only did he win the tittle but also millions of hearts. 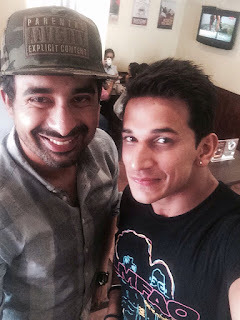 Expressing joy over being the winning Gang Leader, MTV VJ and the original Roadie, Rannvijay said that when we started the journey of Roadies X2, there were many good contestants who were really enthusiastic and came with the do-or-die spirit but like they say there can only be one winner. Prince has been on the top of his game since the beginning of the show he really deserved that number one position, He is extremely thrilled about both his win and he is very happy with Gurmeet's performance also, He remember selecting them together and saying that 'he'll take you guys till the end'.This season of Roadies X2 has been very different and full of emotions, surprises as compared to its previous editions and also a learning of being a motivating gang leader and mentor to the contestants. Chandigarh 29th June:- Presenting an example of strong will and teamwork, the youths of Ward No. 2 villages Khudda Lahora and Khudda Jassu specially made arrangements for the first ever Mega Night Cricket Cup Tournament which took off on Sunday evening at ground adjacent to Khudda Lahora-Jayanti Devi Road, Near Geeta Mandir, Khudda Lahora, Chandigarh. The tournament is being orgainzed by Khudda Lahora Youth Club and will be on till 1st July. On Sunday evening, Ward No. 2 Municipal Councilor Saurabh Joshi inaugurated the tournament along with other dignitaries. This 6-6 over matches' tournament is seeing 60 teams participating from all over Punjab. The winning team will get a cash prize of Rs. 25,000 whereas runners up will bag Rs. 15,000 as prize money. Man of the series will be awarded with Rs. 5,100. The members of the Youth Club have been preparing for the tournament since many days. They leveled the uneven ground with their tractors and also manually. Weeds and long grass was also removed from the site. Special pitch was created with the help of experts. On this occasion, MC Saurabh Joshi praised about the efforts made by the young brigade. Being the honorary secretary of Joshi Foundation Chandigarh, he also spoke against drug abuse and motivated the youth to stay away from the menace. He said that the effort is commendable. I congratulate all the organizers and participants for making the event successful. We look forward to see this event happening on a much bigger scale in future and more and more teams entering in. Sport is a good way to stay fit and disciplined for life and therefore it should be a part of every youth's life. Chandigarh 27th June:- The Regional Finale of Palaash Miss India 2015 was held at Hotel Ramada Plaza. The finalists were selected in a round of auditions held earlier Neha Dabar was crowned Palaash Miss India North, Aatial was declared Palaash Miss India North 1st runner up and, Palaash Miss India North 2nd runner up was bagged by Jasmine Aulakah. The Mega Pageant Grand Finale will be in New Delhi in August after the five rounds of regional finales. Apart from the three crown winners there were four sub-title winners Akshita became Miss Bollywood Diva, Miss Catwalk was won by Manveer, Kareena was crowned Miss Personality and Megha was Miss Talent. The contestants had to go through three rounds before the final winners were announced. They had to compete in the Introduction Round, the Q & A round and the Judges' Round. The panel of Judges included Ms.Bobby Layal, India's Leading Super Model to the Crowing ceremony of the Winners and Sub Contests, Ms.Pallavee Sharma (CEO, panache Global Pvt Ltd.), Inderjeet Singh Soni(Executive Director, Panache Global Pvt Ltd) Kaushik Ghosh, National Pageant Director, Palaash Miss India 2015, and Ms.Bahaar Chawla, socialite and model from Chandigarh. The show was directed and choreographed by India's leading fashion show director and beauty pageant expert Kaushik Ghosh. Ms Pallavee Sharma, CEO, Panache Global Pvt Ltd, on the occasion remarked that the beauty pageant, Palaash Miss India 2015, is a pageant with a cause. This platform provides a glamorous opportunity to those young and dynamic aspirants who wish to showcase their talent in the world of Fashion. She added that the auditions saw aspirants from Chandigarh and different states like Punjab, Himachal Pradesh, Haryana, and Jammu & Kashmir. Out of 27 contestants who were shortlisted, 10 were finally chosen to walk the ramp. After the auditions the finalists attended a two day grooming session with Kaushik Ghosh, Beauty Pageant Director, Palaash Miss India 2015. Chandigarh 27th June:-Max Super Specaility Hospital (MSSH), Mohali in association with Physicians Forum Jalandhar organized a Continue Medical Education (CME) program on 'Bioprosthetic (Tissue) valve- a new paradigm in valvular heart disease' at Jalandhar. As many as 80 doctors attended the CME. Among others, Sandeep Dogra, VP-Operations, Dr. Virendar Sarwal, Director and Head, Department of Cardio Thoracic and Vascular Surgery , MSSH and Dr Alok G Lalwani, President Physicians Forum were presented during occasion. . Addressing doctors, Dr Virender Sarwal said that valvular heart disease formed a major chunk of heart patients in India. It was mainly rheumatic in origin which affected valves. But as the life expectancy was growing, we were seeing a major chunk of patient coming with degenerative valvular heart disease also which was most prevalent in western world. He further said that in India, most of the patient of valvular heart disease would require valve replacements with only few were suitable for repairs. A decade ago, only choice available with heart surgeons was mechanical valves or metallic valve. Bioprosthetic valve or tissue valve came in early 70's but they were first generation valves and their durability was an issue so they started degenerating earlier and fell into disrepute. Talking about the choice of valves, Dr Virender Sarwal said that two types of valves, mechanical and tissue or bioprosthetics were available to surgeons. Mechanical valve were lifelong valves which was made up of pyrolitic carbon and titanium ring but would still need anticoagulants or blood thinners to avoid clot formation on the valves. Bioprosthetics valve were made of animal tissue, pig or bovine pericardium, treated strengthened & fixed with chemicals. Though we would call mechanical valve a lifelong valve, anticoagulation has its own problems of bleeding or thrombosis or clot formation, he remarked. Dr Virender Sarwal asserted that tissue valve has better performance with no risk of bleeding complication. Keeping in mind the growing population of elderly in Asia now , we would need to give these patients a quality life. The technique of implantation was almost the same except a few modifications. The post-operative care was easier and at home it was much simpler as no blood thinner was required. They could be monitored very closely unlike mechanical valve which would fail suddenly and carry higher risk. Chandigarh 27th June:- World renowned journalist, writer and entrepreneur Hindol Sengupta advised to the budding and existing entrepreneurs that don't listen to the World, especially your relatives and even parents, if you wish to be a successful entrepreneur. Dare to take the risks and be courageous to fail as failures are the pillars to success. This was advised by Hindol Sengupta during a Learning session organised by Confederation of Indian Industry's (CII) Young Indians (Yi) Chandigarh Tricity Chapter at CII NR Headquarters in sector 31 A, here today. Hindol Sengupta added that had Steve Jobs told his relatives or parents that he would like to make computers or smart phones, they would have lambasted him. Who knew, he would revolutionize six industries: personal computers, animated movies, music, phones, tablet computing, and digital publishing. He further said that he believes in the power of economy. Entrepreneurship is indeed the key to an all-inclusive progress of our country. Entrepreneurs all across India have supported the Government to provide jobs and enhance the living standards of underprivileged. The entrepreneurs in the unorganised sector still contribute 50 % of our GDP and provide 90 % of the total jobs available in the country, despite just 10 % of institutional finance reaching them. There is a huge potential and hence it is imperative to strengthen our finance system to help it reach more and more small entrepreneurs easily. It is most important that the MUDRA Bank scheme gets truly implemented. The CII Yi session which aimed to inspire new entrepreneurs in India, featured examples from the real stories and case studies of entrepreneurs from Kashmir to Kanyaumari in his latest book - Recasting India: How Entrepreneurship Is Revolutionizing The World's Largest Democracy. He added that we have forgotten that we were a rich country until 1857. Presently, most of the young Indians are trapped in old ideologies and politics. I urge the youth to look for solutions instead of highlighting the problems. Hindol Sengupta is the author of six books including the forth coming 'Being Hindu'. He lives in Delhi and is currently Editor-at-large at Fortune India. 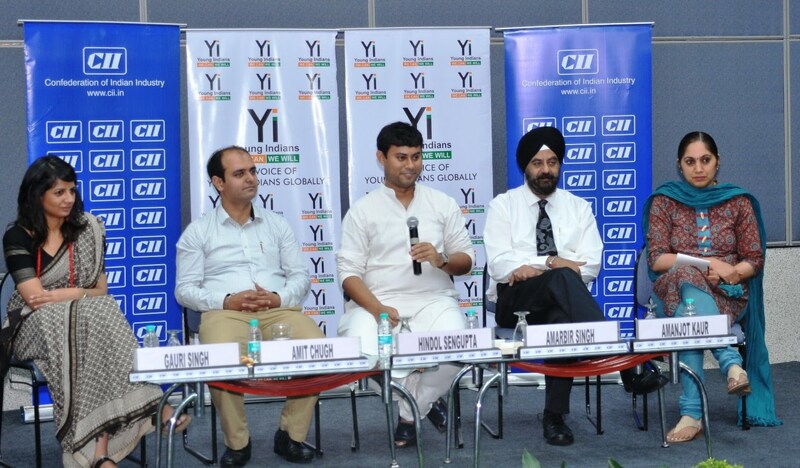 Amit Chugh, Chairman, CII - Young Indians (Yi) Chandigarh Chapter shared that nation building is one of the top priorities of CII Yi. We believe that in addition to smart cities, we also need smart citizens. CII Yi would spread awareness and run a campaign to promote responsibility amongst the society as well to support the governments. 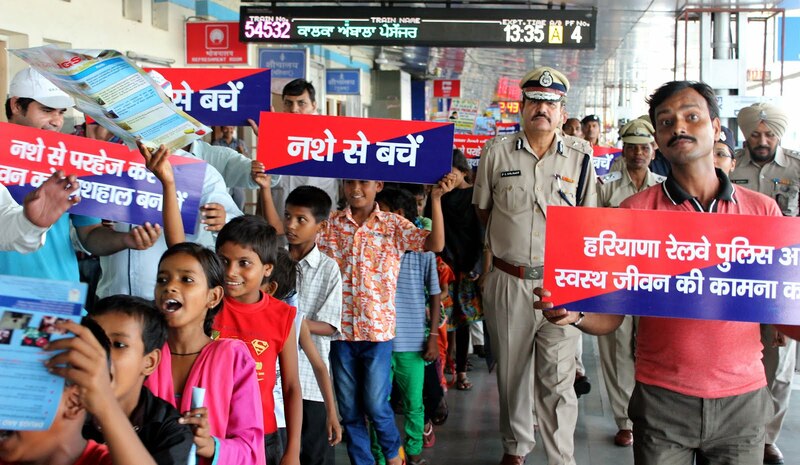 Chandigarh 27th June:- To spread across the message of a drug and narcotics free society, Aashray in collaboration with the railway authorities, Haryana police and 94.3 My fm conducted an event at the railway station Chandigarh to observe 26th june as the international day against drug abuse and illicit trafficking. To grace the event, IPS Paramjit Singh Ahlawat (IGP Railways and Commando) and IPS Manisha Chaudhary(SP Railways) were solicited. The event invited all the members and everyone present about the ill-effects of drug and narcotic us. Pamphlets and mini posters were distributed amongst the members and general public. Members from a narcotics society also attended the event and helped in substantiating the points which were being covered by the event. They also provided their personal experience and tips in combating drug abuse. 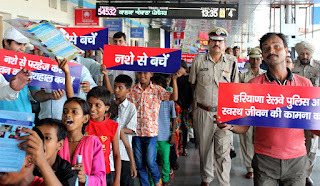 The members, underprivileged children and general public partook in a rally - banners and catchy slogans were raised to catch the eye of the public. Chandigarh 27th June:- Indo Global Colleges achieved 100% of MBA 2015 batch. While giving information about placements of different streams Chairman, Surinder Kumar Singla Said that 3 Mega Placement drive & 27 campus placement drives resulted in very attractive placement achievement. He further added that out of total 415 students in final year of 2015 engineering batch, 291 have got good placements. In B.Tech Computer Science Engineering and Information Technology Branches out of total 102 students, 76 got placed with average salary package of Rs. 2.60 lacs per annum, in Civil Engineering out of 72 students 58 got placements on average salary of Rs. 3.50 lacs per annum, in B.Tech Mechanical Engineering out of 126 students 81 got placed on average salary of Rs.3.8 lacs per annum, in B. Tech Electronics & Communication Engineering out of 101 students 62 got placed on average salary of Rs. 2.20 lacs per annum. The MBA students had many options and the entire batch of 2015 got placed on average salary package of Rs. 3.50 lacs per annum. The highest salary package was 6.5 per annum given by Keystride. Indo Global CEO Manav Singla while giving Information said that the biggest attraction for the students this year was the recruitment drive held by Indian Army and Indian Navy for recruitment of Commissioned Officers. He further added that other remained students are either interested to join a business or want to join job in their home town. He further urged students to work hard to be successful in life. Chandigarh 27th June:- A joint deputation of employees forum Chandigarh and CITU forum Chandigarh today met the deputy commissioner U.T. Chandigarh and submit him a memorandum regarding attack on trade union rights. The delegation was led by com Kuldip Singh President CITU consisting Rajiv Sehgal, Gopal Datt Joshi, Kamaljit Singh and Raghubir Chand. The delegation bring to the notice of deputy commissioner regarding the attack of the police on the peaceful agitation of employees in sector 17 Chandigarh on 23rd of June,2015. The Anganwadi workers of Chandigarh were on peaceful agitation and were sitting on continous dharna in front of the office of director social welfare U.T. Chandigarh situated in sector 17 Chandigarh. On 23rd of June,2015, when they were going to the venue of struggle the police hurl abuses on them mercilessly beaten them and also registered a police case against ten female leaders of Anganwadi employees and two leaders of coordination committee of Govt and MC employees and workers Chandigarh namely Raghubir chand convener and Rajinder Katoch co-convener. The employees leaders were rudely behaved abused and brutely beaten under the guidance of SHO sector 17 Chandigarh and demanded high level enquiry against the police personnel as there is strong resentment amongst the workers and employees of U.T. Chandigarh as the employees forum is the umbrella body of the employees of U.T. Chandigarh has taken a strong notice of this attack of the police on peaceful agitation of the employees. While demanding the enquiry against the SHO the delegation strongly demanded that Police case against the twelve leaders should be withdrawn and the action against the guilty police officers for the attack on the peaceful agitation may be taken immediately to avoid atrocities on the working class in future by the police personnel. Section 144 may be withdrawn immediately in sector 17 Chandigarh to ensure that the democratic rights given under the constitution of India are not encroached upon. It should not be imposed on working class to hold peaceful demonstration for redressal of their grievances in front of their offices. Chandigarh 27th June:- Celkon, today launched its first Indian state-of-the–art manufacturing facility in Medchal located adjacent to the Medchal industrial estate, Telangana. Minister for IT and Pachayat Raj, KalvakuntlaTaraka Rama Rao (KTR) inaugurated the unit along with Y Guru, CMD, Celkon Mobiles and Murali Retineni, Executive Director Celkon Mobiles. The move also comes in timely with the Govt. of India's 'Make in India' initiative. The manufacturing unit is 30,000 Sqft in area and is ready to start production from Day 1, making Celkon the first brand to start operations in the state. The unit will start with4 production lines which will deliver a production capacity of 2lakh units per month. The production lines will be increased to 12 and the production is expected to touch 5 lakhs per month with-in the next quarter. Additionally the state-of-the-art facility will also contain a 10,000 Sq. ft. warehouse for raw materials and a 5000 Sq. ft. warehouse for finished products. Around 60% of the mobile phones manufactured in the facility will comprise of feature phones and the rest will be Smartphones. The facility is ISO Certified. Commenting during the inauguration of the unit Y Guru, Chairman and Managing Director, Celkon Mobiles said that we are elated to be amongst the first few Smartphone players starting our manufacturing operations in India. We envision the country to become a hub for manufacturing cutting edge devices and have been actively pursuing the cause for the last few years. Being a part of the Central Govt. 's 'Make in India' initiative, we feel that our manufacturing operations in India are beginning on a high note. This also comes in at a time when India is poised to become the largest consumer base for mobile phones and we are all set to bring-in the new phase of growth at Celkon. Chandigarh 27th June:- Thomas Cook (India) Ltd, announces the launch of its monsoon special packages 'Drizzlers 2015'. Offering travellers the opportunity to leverage and make the most of off-season travel, 'Drizzlers 2015' gives the 'value seeker' Indian consumers' more than one reason to pack their bags. Optimising the excess supply and perishable inventory (both hotel and air), 'Drizzlers 2015' offers select international packages at upto 25-30% lower prices compared to peak season travel; domestic packages at 15% off and a further launch offer of a special discount of 5% on international tours. Thomas Cook India's internal research has revealed a significant trend- an uptake of over 22% in monsoon bookings, both domestic and international. To capture this emerging market for off-season travel, Thomas Cook India has added more than 100 new destinations (short haul & long haul) with the launch of 'Drizzlers 2015'. The packages aim to give travellers a two pronged benefit: a great holiday to relax and rejuvenate, away from the stress of city/work life and avail great deals in the process. Launching 'Drizzlers 2015', Rajeev Kale, Chief Operating Officer- Domestic, MICE & Sports Tourism, Thomas Cook (India) Ltd. Said that monsoons are typically considered to be a lean travel period for families, courtesy commencement of schools etc. However, witnessing an impactful extension in the traditional booking season, our 'Drizzlers 2015' holiday packages are a neat value proposition for consumers to get away from the hustle and bustle of the city.He further added that this trend is especially high with budget travellers at both ends of the spectrum Gen Y as well as Gen S equally so for solo travellers. The hotels too provide flexibility in terms of available inventory and complimentary upgrades of rooms. For the international packages, Ms. Shibani Phadkar, Senior Vice President - Products & Operations, Leisure Travel (Outbound), Thomas Cook (India) Ltd. Said that taking a cue from the success of 'Drizzlers 2014' and our consumer research, we have developed delightful getaways– both short breaks and long haul destinations. Our Product Contracting Team has negotiated attractive rates for our Drizzlers 2015 packages- we've been able to leverage 3 strengths to ensure significant consumer savings: our bulk-buy clout, our volume growth and interest for emerging destinations. Chandigarh 27th June:- Continuing the legacy of promoting art and culture Pracheen Kala Kendra, in collaboration with Chandigarh Administration, is organizing an extremely innovative Musical Concert titled "Smelting Contours" on Saturday June 27, 2015 at 7:00p.m onwards at Tagore Theater Chandigarh which will feature legendary artists of our country namely Ranjit Barot and Pt. Sandeep Mahavir from Mumbai. This concert will be unique and first of its time as it will showcase the intricacies of two art styles i.e. 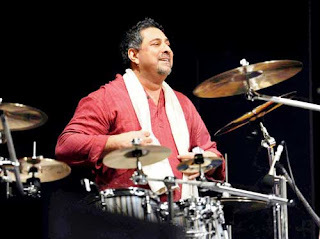 Indian Classical, Kathak Dance and Western Jazz Druming . The title "Smelting Contours" meaning melting of boundaries is truly apt because this concert will feature the blending of different flavors of art i.e. Kathak Dance and Jazz Druming. It will showcase the whirlpool of Classical rhythms through interplay of twists and turns of Kathak by Pt. Sandeep Mahavir and magnificent tempos and time signatures of Drums by Ranjit Barot . These two artists are world renowned in their respective fields. As we are all aware that whenever two cultures live, grow and developed together, they influence each other in some way or the other. Due to decades of association and exposure to west, the western arts have become very much part and parcel of our culture, So Pracheen Kala Kendra has decided to organise this type of concert yearly to cater our Classical art to the younger generations which is fascinated and attracted to western arts. Concerts like "Smelting Contours" will arouse interest of youngsters in our Classical art and culture and give them an example that how our classical arts can be fused with the western arts. Chandigarh 27th June:- ARPAN, an employee volunteering group, of Infosys Chandigarh in association with the Infosys Foundation, the company's philanthropic arm, today kick-started its CSR activities for Fiscal Year 2016. At an event held at the Infosys campus in Chandigarh, the Hon'ble Governor of Haryana, Punjab & Administrator, UT, Chandigarh, Prof. Kaptan Singh Solanki congratulated the employees and volunteers for their benevolent efforts to positively impact the local community. He also laid emphasize on the responsibility that lies on corporates to create opportunities for the underprivileged in order to build an equitable society. The event saw participation from Principals and students of various local schools, who will benefit from the many initiatives of ARPAN. Some of the initiatives planned for the year include educational support for student from poor backgrounds, nutrition and blood donation drives, and support for victims of natural calamities and plantation drives. A large percentage of the investment will be dedicated for the education of 80 meritorious students from economically weaker sections of the society. Chandigarh 27th June:- To ensure sexual and reproductive health of women, Kanwar Pal Gujjar, Speaker, Haryana Vidhan Sabha today called for strengthening laws. Stressing on the need for development, he said development is important but it needs to be seen that development doesn't lead to inequality, which often results in widening the rich and poor divide. He was speaking as the chief guest at one day State Level Consultation with Parliamentarians and key stakeholders on Sexual and Reproductive Health and Rights (SRHR). 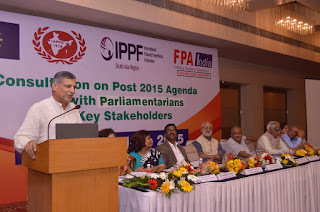 It was organised by the Family Planning Association of India (FPAI), Panchkula Branch in collaboration with Indian Association of Parliamentarians on Population and Development (IAPPD), and International Planned Parenthood Federation. This consultation was supported by European Union through International Planned Parenthood Federation (IPPF) – South Asia Regional Office (SARO). The Haryana Speaker stressed that all political parties need to work collectively for the cause in national interest, keeping aside their political gains of pleasing the vote bank. The purpose of the conference was to initiate a dialogue on the Sustainable Development Goals (SDGs) in articulating the Post-2015 development agenda with focus on SRHR including family planning and HIV in terms of health, gender and means of implementation. Shakuntala Jakhu, IAS retired, former Chief Secretary Haryana while delivering the keynote address lauded the work done by FPAI and stressed on qualitative development, adding that existing government policies should be scrutinised whether they are bringing a positive change in the lives of beneficiaries. 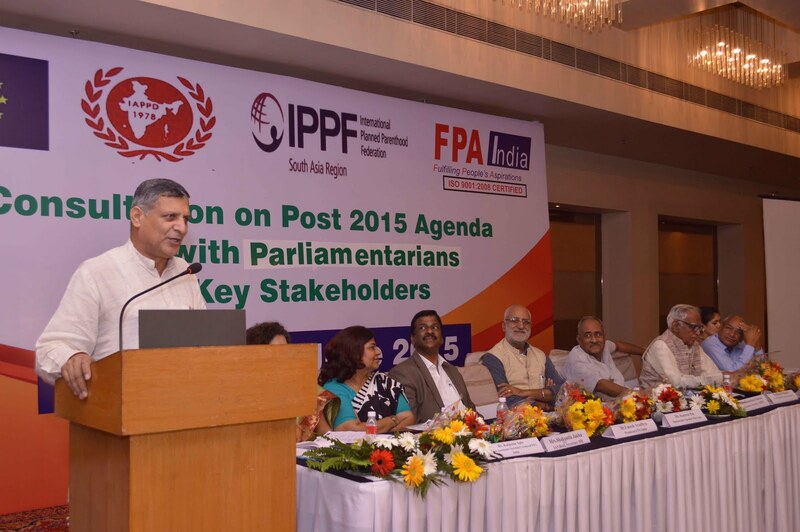 Umesh Aradhya, President, Family Planning Association of India (FPA India) said that Post 2015 development agenda in India should be focused on state level variations and priorities. We hope that our MPs and MLAs would raise these important issues in parliament and legislative assemblies for formulating proper policies. While setting the context Dr. Kalpana Apte, Senior Secretary General, Programme Implementation, FPA India stressed Post 2-15 development agenda must include the unfinished agenda from Millennium Development Goals (MDGs) and ensure that no one is left behind - maternal health, comprehensive sexuality education and reproductive rights are important. Usha Pahwa, Panchkula Branch President mentioned that this consultation will influence to design the State and District perspective. The MP and MLAs has accountability in the state and the country. She further emphasized the post 2015 development framework is relevant to us and we need to engage with the process further and what we still need to advocate what has taken place so far in the process. The next framework will affect all our lives so it is imperative that it reflects our priorities and such priorities include Sexual & Reproductive Health and Rights. Manmohan Sharma, Executive Secretary, IAPPD also spoke on the occasion and gave an overview about the activities of IAPPD and FPAI. Vivek Atray, Deputy Commissioner, Panchkula, said there should be sustainable segments of society. Gian Chand Gupta, MLA, Panchkula also spoke on the occasion. According to Vedika Gandhi a youth volunteer said Post 2015 will be more holistic than the Millennium Development Goals and will take into consideration all three pillars of sustainable development i.e. economic, environmental and social, with the potential of a fourth pillar, peace and security. Family Planning Association of India (FPA India) has been working in the field of Sexual and Reproductive health and Rights (SRH&R) since 1949. FPA India Panchkula Branch has been working on SRH&R since 1972 in Haryana and supplementing the efforts of the government to make health services reached the most needy and poor community both in the urban and rural areas. Among other prominent guests were MPs and MLAs of Haryana State who shared their voices at the occasion including Shadi Lal Batra, Rajya Sabha Member, Dr. Ram Prakash Ex MP and Chancellor Gurukul Vidyapeeth and R.K. Kashyap, MP. Chandigarh 27th June:- Vodafone Foundation has launched the fifth edition of their flagship initiative 'Mobile for Good Awards 2015', in partnership with NASSCOM Foundation, through the NASSCOM Social Innovation Forum. The Awards recognise and support emerging talent and innovative mobile solutions from NGOs and 'For profit' enterprises that facilitate community empowerment and inclusive growth. This year, 11 winning innovations will be recognised across two categories – 'Leading Change Maker – NPO' and 'Leading Change Maker – For Profit'. Innovative mobile driven solutions in four critical areas of Health, Education, Agriculture & Environment and Women Empowerment & Inclusive Development will be selected from both the categories. This year, there will also be a special award for a Government led solution for achievement in the NPO category. Vodafone Foundation will provide a grant of INR 1.2 million to five winning NGOs/NPOs in addition to structured mentoring, monitoring and impact evaluation support from partner institutions, incubators etc. for them to achieve a larger impact. All winning projects will also be featured in the soon-to-launch first of its kind-social Apps Marketplace by Vodafone. Applicants from NGOs / NFPs and for profit organisations can submit their entries on the portal www.vodafone.in/mobileforgood until 31 July 2015. Speaking about the Mobile for Good Awards, P Balaji, Director- Regulatory & External Affairs, Vodafone India, said that this year, 'the Mobile for Good Awards' a marquee proposition from Vodafone Foundation, enters fifth year of its successful social initiative to recognize innovative mobile solutions in the country. Our mission, in line with the government's vision of Digital India, is to build a platform for these innovators, recognize them and support them further for scalability and sustainability through funding and mentorship. This year with a new partnership with NASSCOM Social Innovation Forum, we intend to reach out to the mobile innovations across India and provide them with the necessary help for a greater impact. Shrikant Sinha, CEO, NASSCOM Foundation, said that we are glad to collaborate with Vodafone Foundation to enable the most powerful tool in people's hands today, help improve their lives" He further added, "We are hopeful that Mobile for Good will act as a catalyst to bring forward break through innovations in mobile technology from across the country and these innovations will help integrate social objectives with technology to fuel social development in India." 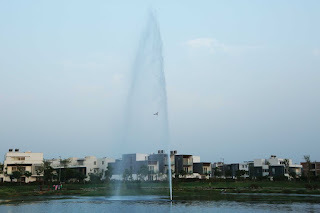 Chandigarh 25th June:- India's first and largest private equity fund dedicated to the Indian real estate sector, Ireo, recently unveiled the first manmade lake of Ludhiana at its premium 500-acre township, Ireo Waterfront. The 8 acre lake, part of the larger 13 acre lake complex, creates a unique lifestyle experience for existing as well as future residents of Ireo Waterfront township. The lake and its surrounding lush landscape have also started attracting visitors, especially photographers and bird watchers, for the natural beauty, relaxing ambience and the variety of flora and fauna. Various cultural and recreational activities are organized by Ireo from time to time offering a rich and indulgent experience for the people of Ludhiana. Work is in full swing at the lakeside facilities including food and beverage areas, cultural plazas and sports and fitness zones. An eye-catching feature of the lake is the 100 feet high fountain, which is lit at night and can be seen from all sides of the lake. The fountain also helps in the aeration process of the lake water. Designed by renowned landscape architects including UDA (Pittsburgh, USA), Aedas (Hong Kong) and Parsons Brinckerhoff (India), the lake has many other attractive features including an island near the south western edge and two lake jetties providing a closer interface with water and serving as a scenic photography spot. 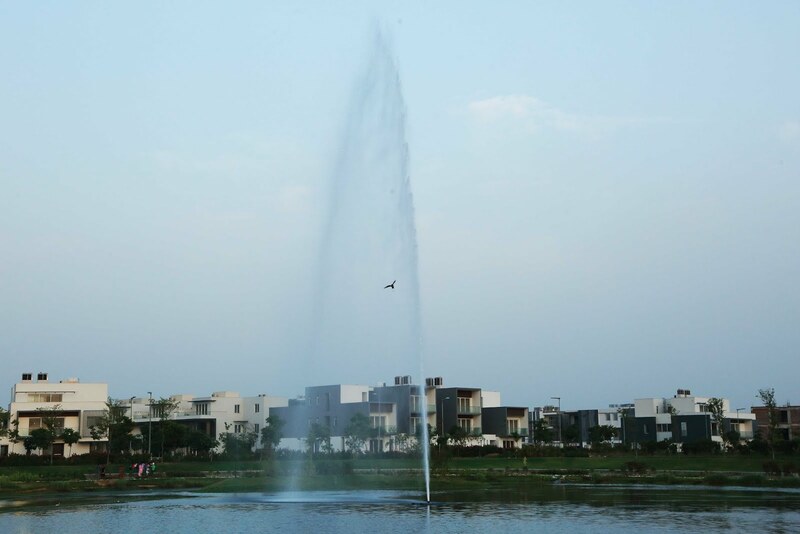 According to Madhukar Tulsi, President, IREO said that we are thrilled to announce the completion of Ludhiana's first manmade lake, which marks a significant milestone in the development of this 500 acre township. Our existing as well as future township residents will take pride in the exclusive lakeside living experience that has already started to take shape with the completion of the lake. Recreational facilities are coming up at a fast pace. When complete, the lake complex will be the talk-of-the-town destination featuring lakeside cafes, world famous club and spa, open-air cultural plazas and more. Chandigarh 25th June:- Mahindra & Mahindra Ltd. today launched its all new small commercial vehicle, Jeeto in Chandigarh. Jeeto is the first ever product in its category with a modular range of 8 mini-trucks to cater to the varied needs of the sub 1 tonne load segment customers. Priced competitively, Jeeto starts at Rs. 2.49 lac (ex-showroom Chandigarh for BSIII) and will be available in S, L & X series, catering to mini-truck, micro-truck and 3 wheelers customers. Giving more detail about Jeeto, CMO-Automative, Vivek Nayar said that Jeeto will be a game changer in last mile distribution with its modular range, as it offers multiple options to choose from - 2 powertrains of 8.2kW (11HP) and 11.9 Kw (16HP),2 pay loads of 600 and 700 kgs and 3 deck lengths of 1630mm(5.5ft), 1780mm(6ft) and 1930mm(6.5ft).These combinations will be available across a range of 8 mini-trucks, namely S series (S6-11, S6-16), L series (L6-11, L6-16, L7-11, L7-16) and X series (X7-11, X7-16) and will lend the Mahindra Jeeto an unmatched versatility and superior efficiency to haul goods across different segments. He added that powered by m-Dura, an all-new Direct Injection (DI) diesel engine from the Mahindra stable, Jeeto is designed for refined performance and delivers fuel efficiency of upto 37.6 km/l. Further coupled with lower maintenance cost and the ability to carry varied load options effectively, Jeeto, will deliver upto 30%* higher profit than its nearest competitor. He further said that Jeeto also comes with a class-leading warranty of 2 years/40,000km (whichever is earlier). It will be available in 5 attractive colours of Diamond White, Sunrise Red, Mango Yellow, Ultramarine Blue and Premium Biege. Punjab Education Minister Constitute a Core Group to Improve the Language Skills of English Teachers. Chandigarh 25th June:- Deeply concerned over the poor standard of English shown by English teachers of different government schools with poor results in English language, the Punjab Education Minister Dr Daljit Singh Cheema today of experts to work out a long term strategy to improve the language skills of English teachers. Disclosing this here today, the official spokesman said that core group consisting of heads of 17 District Institute of Education Training (DIET), heads of 12 Government In Service Teachers Training Institutes (GIST) have been called for emergent meeting tomorrow at Mohali to chalk out a long term and short term strategy to improve the English language skills of English teachers. The core group has been mandated with the task of studying the problem in depth, work out a crash course for the teachers, curriculum of the crash course besides working out the details of long term training programme for English teachers of such schools. Dr Cheema has issued instructions that he would personally monitor the training programme and would ensure that teachers would have to raise their teaching standards to tackle this problem permanently. 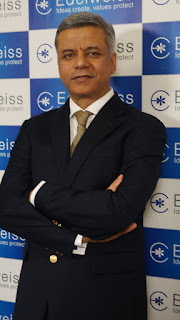 Chandigarh 24th June:- Edelweiss Financial Services Limited, has appointed Anil Sarin as CIO – Equity, Global Asset Management. The Global Asset Management Group (GAM) at Edelweiss encompasses the entire range of asset management services including Investment Funds and Credit Alternative Funds, Mutual Funds and Portfolio Management Services. In this role, Anil will oversee the investment strategy & mentor long only equity funds across GAM and will report into Nitin Jain, CEO, Global Asset & Wealth Management. Anil will also be responsible for creating investment policy frameworks across Edelweiss Global Asset Management. Anil comes with over 20 years' experience in Fund Management. Prior to joining Edelweiss, he was the Co-Founder of AQF Advisors, a start-up providing Asset Management services on an outsourced basis. He has also worked at Bessemer Venture Partners, as Managing Director & Partner. Anil started his career with SBI Mutual Funds after passing out from IMT, Ghaziabad. Post SBI Mutual Funds, he joined Birla Sun Life and grew from being a buy-side research analyst to a Fund Manager for the Birla IT Fund, Birla MNC Fund and Birla Tax Plan. Earlier, Anil was also Co-Head, Equities at Prudential ICICI Prudential Mutual Fund, where he managed ICICI Prudential Mutual Fund's Dynamic Fund, Emerging Star Fund and Power Fund. Chandigarh 24th June:- Dr. Daljit Singh Cheema, Education Minister, Punjab has asked the teachers to ensure the academic standards of the government schools and improve the education system. Presiding over a meeting of 10 English teachers from each district, Dr. Cheema reviewed current academic years' matriculation result in which around 80,000 students failed in English language. To reach to a logical conclusion of this massive failure, Dr. Daljit Singh Cheema prepared a questionnaire for the English teachers in which he has asked them to write down the reasons of the failure and also sought suggestions regarding further improvement in result of especially English language. Meanwhile he had an in person communication with the teachers for such a low result. The scanned copies of questionnaire were projected on screen and Dr. Cheema directly discussed the questionnaire and subsequent replies of the teachers with the senior officers of the department of Education. Most of the suggestions and reasons given by the teacher were inappropriate like student belonged to poor families, inadequate staff, students not willing to attend the classes etc. The Minister expressed concern over the deteriorating academic standards in the schools and said the teachers were more responsible for the decline than the students. It was a matter of grave concern that the replies given by the teachers projected on the screen were full of grammatical errors and lower standard of English, which signified that even teachers were not capable of giving good lessons of English to the students. He directed all the officials related to education department to collect the suitable suggestions and reasons so that the system could be rectified as soon as possible and better results in the field of education could be drawn. The Minister also said if any changes required in the academic syllabi or in the current policies regarding education that should also be brought under consideration. During the course of the meeting, Dr. Cheema said also said that the department of education was always opened to suggestions and would cooperate and support the teachers for the betterment of the students. He also mentioned that student's poor economic conditions, areas backwardness and assigning the teachers to other duties could not be the reasons behind such a massive failure of the students. He argued further saying that there were some schools which had the same infrastructure and conditions but have shown comparatively better results. Concluding the meeting, the Minister said that the teachers would be given proper training session especially teaching English language and appealed to the teacher to ensure right type of teaching so as to improve the academic standards in government schools.